The band saw is widely regarded as among the safest of all woodworking machinery. However, it is still a dangerous woodworking tool, one that can cause considerable injury if used improperly. There are a number of items to keep in mind when using your band saw to diminish the risk of injury and to help you get the most out of your tool. First and foremost, when working with any woodworking tools, always wear safety glasses. Band saw blades rotate at considerable speed, and small pieces of stock can be propelled in nearly any direction. Even worse, if a blade breaks, the possibility exists that a piece could come loose. Your eyesight is too valuable to take chances woodworking without protective eyewear. Develop the habit of wearing your safety glasses at all times. When using a band saw for woodworking, it is doubtful that the noise level would require hearing protection, but if you feel more comfortable wearing ear plugs or ear muffs when using your band saw, by all means, do so. You should also wear appropriate clothing for working with your band saw. Avoid loose-fitting clothing, particularly long-sleeved shirts, that could get caught in your work or in the band saw blade. Your band saw utilizes a substantial number of blocks and wheels to keep the blade in its proper position throughout a cut. These blocks and wheels should be regularly checked for wear and adjusted as per your manufacturer's recommendations. Failure to adjust these blocks and wheels appropriately will cause undue wear and tear on the blade, and likely cause the blade to break prematurely. And check that the tension on the blade is set to within the limits outlined in your band saw's owner's manual. Once your band saw is adjusted properly and tightened to the appropriate tension level for the blade you're using, you should prepare the saw to make a cut on your stock. With the motor turned off, place the stock to be cut flat on the band saw's table, and lower the blade guards to within 1/8 inch to 1/4 inch of the stock. Leaving the blade guards too high will place undue tension on the blade, increasing the likelihood you'll break the blade. Keeping the blade guard within this distance from the stock will also increase the accuracy of your cut. Start up the band saw and wait until the motor is at full speed before beginning any cut. When operating a band saw, always place the stock flat against the table. Do not attempt to "free-hand" the stock in mid-air. The stock must remain flat on the surface of the table at all times during the cut. If a specific, consistent-width rip or specific angle is to be cut, use a band saw rip fence or miter gauge to assist with the cut. Not only will this increase the accuracy of the cut, but it will make the cut safer as well. When cutting curves, draw the outline of your projected cut cleanly on the stock. Then, keeping the wood flat against the table, ease the stock through the saw along the outer edge of the cut line. It is almost always preferable to leave a slight bit of stock outside the line that can be cleaned up with a spindle sander after completion of the cut, as your band saw blade will likely leave cut marks that need to be sanded smooth. Cutting directly against the cut line will not leave room for sanding. When cutting curves, always move slowly and methodically. If you must back out of your cut, hold the stock firmly in place with one hand and turn the motor off with the other. Do not attempt to back the stock out of the cut until the blade has come to a complete stop. When cutting tight curves, go slowly and use "relief cuts" wherever possible. These are cuts that cut through scrap portions of your cut out to give you a better angle on accessing a section of your outline. It is safer to make a lot of relief cuts and cut a tight curve in short sections than to try and make one long, inaccurate cut. At no time during any of your cuts should your hands be any closer than about three inches from the blade. One hand should be on each side of the stock, easing it through the blade. You should never place your hand directly in the cut line, even if it is more than three inches away. If you must hold the stock closer than three inches, do so only with a push stick. When using your band saw, there will often be very small pieces of stock that are cut off of your big piece of wood during the cutting process. Do not attempt to flick these away from the blade with your fingers. Use another piece of stock or a push stick, preferably with the blade stopped. Often this is not necessary, as the next cut will push the piece safely away from the blade. Once it is clear, push it off of the table. Never leave loose pieces on your table that could impede your cut. 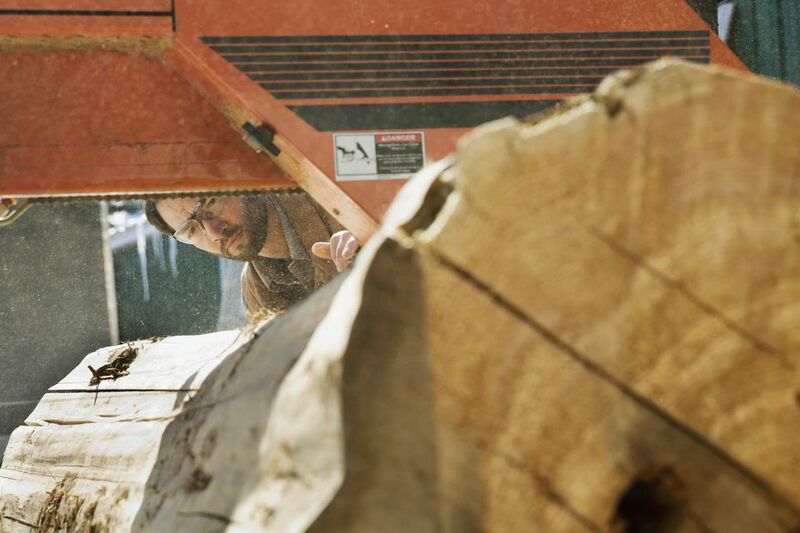 When working with woodworking machinery, do everything you can to avoid distractions. If someone tries to interrupt you while making a cut, do not avert your eyes from the tool; finish the cut or safely turn off the saw before diverting your attention. Too often, injuries occur because the operator was distracted, even for only a moment. Establish a rule with those around you who might be inclined to interrupt: If they need to disrupt you when working with your woodworking machinery, ask them to wait until the cut is complete before interrupting so you can give your full attention to them.